I think the picture tells its own story. Yesterday after going around looking at second hand furniture shops, and buying more paraphernalia for our house. We decided to do something on the tourist side of things. In case you are wondering what Sharon is doing when I am taking the photos, here's a clue. We went down to one of the main streets in the town and took the Cable Car up into the mountains. You can see from the photo, that apart from the reward of experiencing the Cable Car ride itself, you also get to visit the treasures on the top such as the Botanical Gardens. We will have more on the gardens on a later post put for now I am happy to deal with the Cable Car itself. 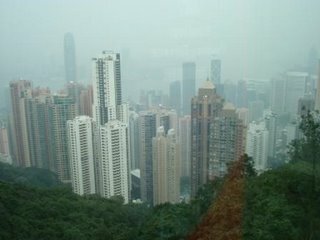 The topography of Wellington City is very similar to that of Hong Kong, in that the buildings are sandwiched between the mountains and the sea. Over the years both cities have succumbed to the demand for further development and sprawled, in a compact way, up the mountains and through the valleys. 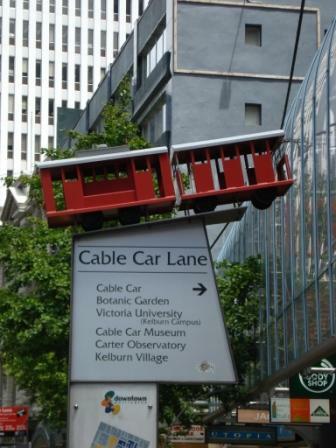 It is no surprise then to learn that Hong Kong has a cable car also called the Peak Tram, which it has to be said is far more hair raising that the Wellingtonians version. Sorry Wellington. 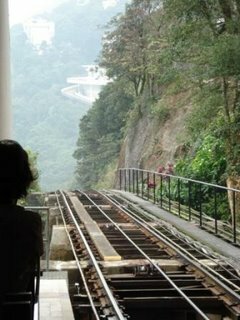 The Peak Trams incline is over 25 degrees in some places and you really just hope the cable doesn’t snap when it rocks to a stationary position at one of its many stops on the slope. The Peak Tram is so steep that the seats only face one direction otherwise you would end up apologies profusely to the couple opposite that your intentions were purely honourable while peeling yourself off them on the way back down. Here is a photo from the top of the Peak Tram and the roller coaster type view of the drop from the top. 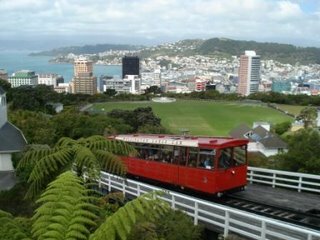 In any event we enjoyed the Wellington Cable Car and in particular the brilliant weather. Which ever way the Botanical Gardens were situated there wasn’t a breath of wind. 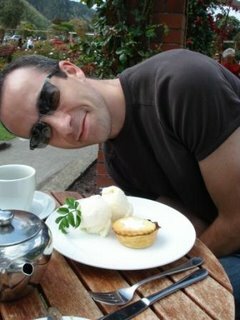 We had some tea in the tea house, where else, and I decided to have a mince pie with ice cream. Well it is Christmas after all. I have to say it was not as nice as my mammy’s but the sunshine helped ease the disappointment. Here are some photo's.